Valentine’s Day In Germany – Sunshine. Whimsy. Tacos. Like Halloween, Valentine’s Day is a late addition to Germany. Children here don’t typically exchange valentines in school like I did growing up, and the holiday is mostly for romantic couples here. The stores here don’t usually sell children’s Valentine’s cards like you would find in the US, but the rest of the trappings of the holiday are pretty easy to find- red hearts full of chocolate, balloons, flowers- Hallmark and FTD would never let a market slip through their iron fist that easily. That being said, Germany does have its share of interesting traditions that aren’t generally found in the US. 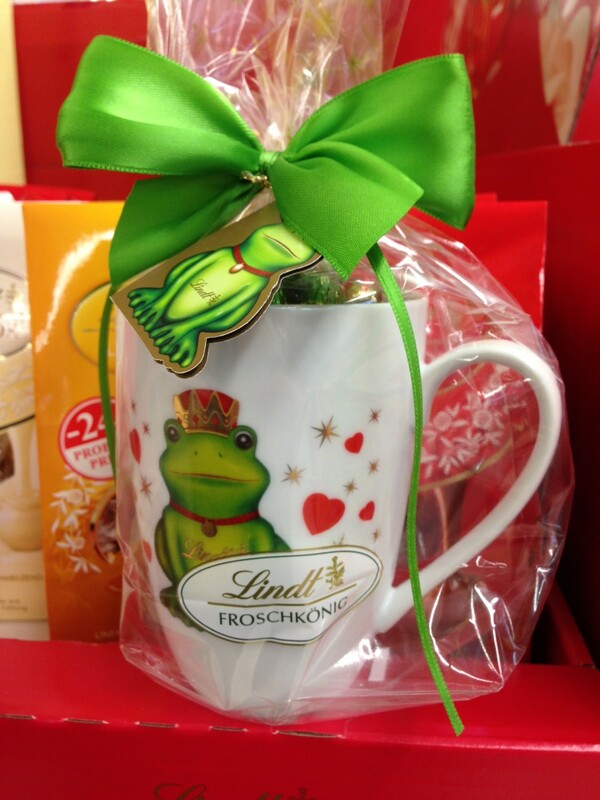 Among the red hearts full of chocolate and candy are the green foil wrappings of Lindt’s Der Froschkönig, the Frog King. 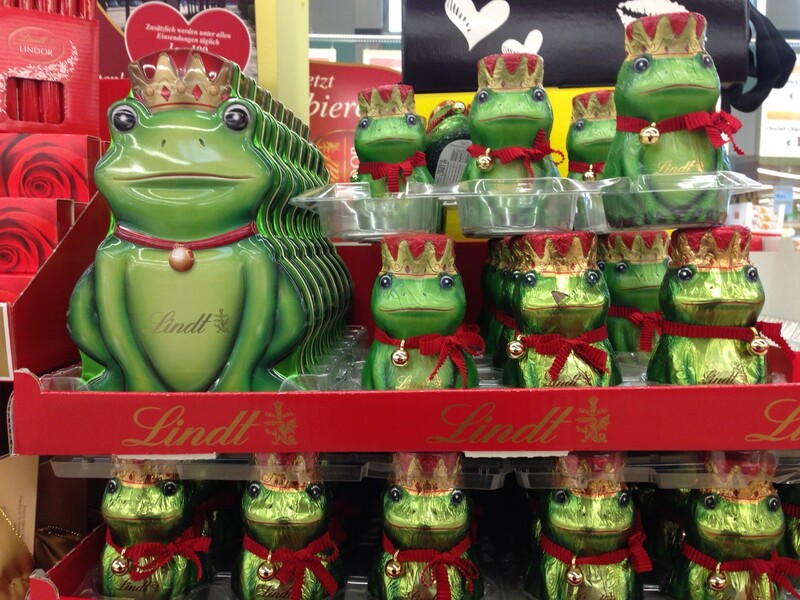 The connection of the Frog King to Valentine’s Day seems to be based loosely on the Brothers Grimm faery tale of the Frog Prince. Eating a chocolate frog is better than kissing frogs, I guess. In the original Brothers Grimm version, the frog’s spell was broken when the princess threw it against a wall though. Maybe you’re supposed to throw your chocolate frog at the wall also. Either way, he sure is cute. 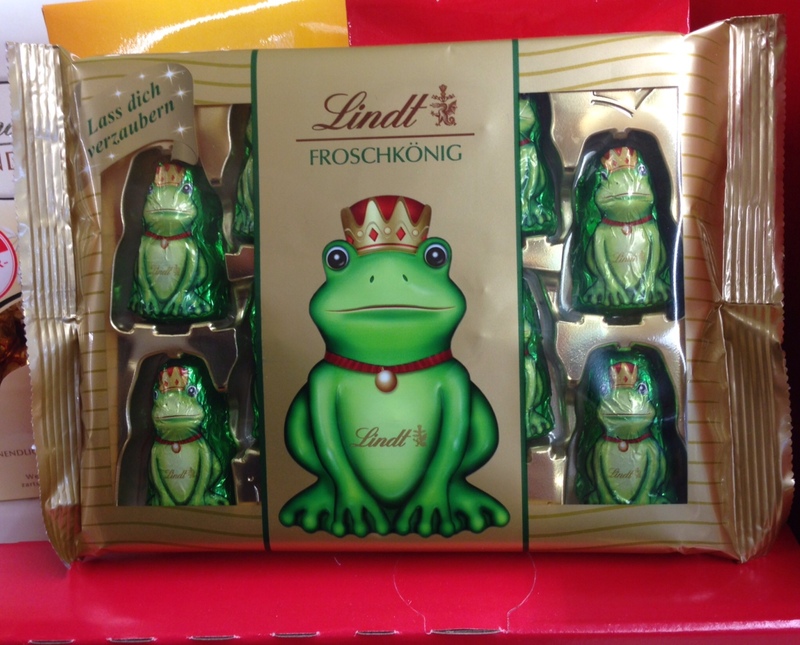 Here are some of this year’s Froschkönig offerings. Happy Valentine’s Day, everyone! Do you have any interesting Valentine’s Day traditions to share? Aw, I love the Froschkönig. They didn’t have that when I was still living there. So interesting ! thanks for share this German tradition. In Japan, on valentine’s day women give men chocolate (mostly hand made) to not only their boyfriends but also to guys they work with, including their bosses, and other male friends they have. A month later there’s white day, where men have to give chocolates to all those women who gave them chocolate. I like this custom quite a lot! It’s good, because it’s not really an excuse to hit on people, and there’s no chance for heartbreak, really. At my school we were able to purchase single roses a couple of days ahead, which were the distributed on Valentine’s Day. When you ordered them, you could choose whether to attach a message or have it delivered anonymously. That’s something that was done when I was in high school. I’m pleased to see these activities crossing the ocean.